Applications: Trizact 237AA material will work most steels and is most popular for use on stainless steel and harder alloys. It has the characteristic of giving a relatively high cut rate, even in finer grades. It can thus offer the advantage of giving fine finishes in fewer stages and at a faster rate than is achieved by most convential abrasives. 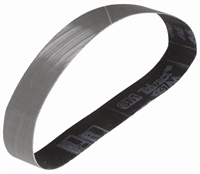 Trizact 237AA can be made into belts of almost any size, but due to its higher cost it can be worth keeping the specified width to the minimum needed. Product Notes: Trizact is a structured grain abrasive made with fused and re-processed aluminium oxide. It is grades differently from most abrasives. We have only listed a very small number of example options here. We will be pleased to quote the sizes you require for your sanding machine. Please enquire. Also Available: We stock knife craft belt sets in the popular 2"x72" size for American inspired belt grinders. These include Triazct belts.